Kabir started a project in 2013 and completed it in 2015. 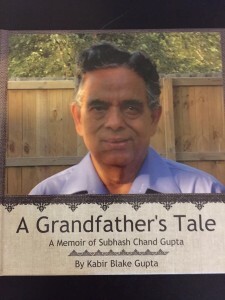 He spent about half an hour with his grandfather (whenever he was living with us in America) listening to his stories. He typed these stories and created a biography of his grandfather. Mrs. Heather Tate helped him for the last one year editing his work and guiding his project. Then we added the old photos and created a book at mixbook.com. Finally, we published it in a book. 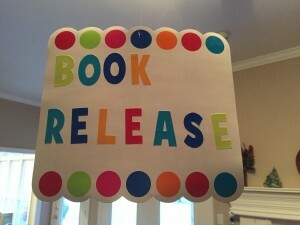 This Saturday we had a little book release party for him with Tate family to celebrate. It has been a really worthwhile project! The advantages of this project has been felt and will be felt lifelong so much so that it’s very hard to put it in words. Neha Jhunjhunwala Mimani, you are too sweet. I would love to read the book. Congratulations! Wishing you a great future in writing if that is what you would like. Wow! You always inspire me to do something new and that’s why I follow your blog!! ???? Yay, Kabir! What smart & awewome neighbors I have! I want to see/read the book! I would love to purchase a copy! You know boys just need an excuse to come to you. I have to stop them otherwise they are always itching to visit you. Been so long! Wish we could get together once again with Maria, you and me! Kudos to Kabir! Congrats on being a published author! ??? kabir you made all of us proud of you.and inspiration to all the kids. my love and blessings are always with you. wish you all the best and heartiest congratulation onyour firststory book. Thank you. How are you bhabhi? I enjoy your photos on FB. I welcome them ANYTIME! They are some of my very favorite visitors!!! Thank you Paula! You may take a look at it when you visit us next time.